On this episode, Landmark Home and Land Company president Steve Tuma answers Interesting questions from customers on how Landmark can help with designing and building their new home, and addresses some common fallacies regarding Panelized home building. Interviewer: Hey everyone. 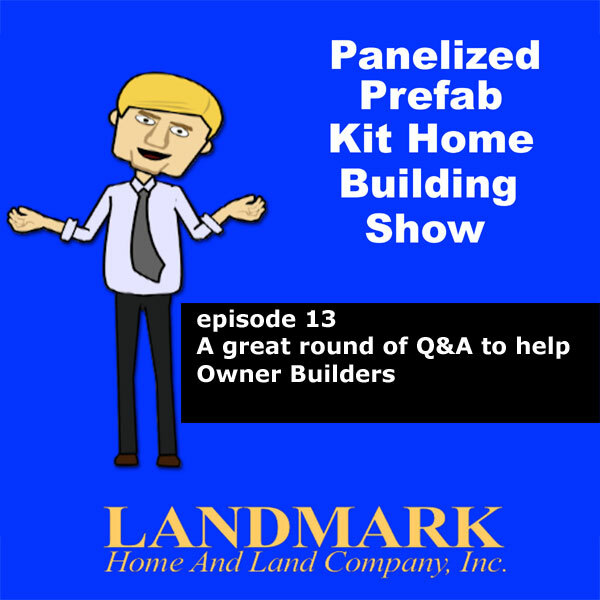 Welcome to another episode of the Panelized Prefab Kit Home Building Show. With me as always is the President and Founder of Landmark Home and Land Company, a company which has been helping people build their new homes, where they want, exactly as they want across the nation and worldwide since 1993 and that’s Steve Tuma. How are you doing Steve? Steve Landmark: Excellent. It’s a great day today and hello out there panelized home building world. Interviewer: What do you say we talk about panelized home building? I think that’s a good place to start. Steve Landmark: I think I know a few things about it. Interviewer: I think you do. One of the things we’re being asked about by customers and potential customers writing in is about the building-planning phases, the different phases after you’ve – you decide to build a house and you want to start designing and understanding that whole process. A lot of people I imagine just figure you can grab a piece of paper or a napkin at a restaurant and design a home by drawing it on a piece of paper and I would imagine it’s a little more complex than that. Steve Landmark: Well, the initial concept can start there because someone might have an idea of hey, I want to build a 2000-square-foot ranch with a three-car garage or gaming room, a home theater, a master suite. You know, big Eden kitchen or a kitchen with a peninsula or an island or something like that. But Steve, when Landmark drew the plans up for my new panelized home, the rooms weren’t the same size or the house had to get a little bigger, whatever it may be. The reason being, there are certain dimensions for wall thicknesses. There are certain things that have certain codes. So for example, people will draw a house. Say there was a 40-foot wide house and they wanted four rooms, they will draw it up as being four 10-foot rooms. Hey, that makes sense. It’s 40-feet wide. But the issue is they forgot the thickness of the interior and exterior walls. So you can lose a couple of feet in there and that’s one of the reasons – just to make sure that the plans are accurate, but there’s also code issues. Hallways have to be a certain thickness, a certain amount of space around toilets, a certain amount of space to work in kitchens. It’s like yeah, but that software doesn’t make sure it’s structurally sound. It doesn’t make sure the codes are adhered to. It doesn’t make sure that the plan makes sense. Steve Landmark: It’s basically taking your idea, so you could get the concept on a paper so then we can help you with our complete planning phase. I think that a lot of – this is one of those things of you don’t know what you don’t know. So it’s interesting as people start if they’re – you know, just sketch something on a piece of paper and then they see the final set of plans. It just happened to me today. So that’s part of the reason. But the – it’s not just to make sure it’s planned out right. When you go to a contractor and say, “Hey, can you give me a drywall quote or a heating quote?” when they see a real set of plans with real dimensions, they can do a better job to provide you a quote. If someone has just a sketch on a napkin, it’s kind of like the idea of garbage in, garbage out. So the better information you have, the more serious they’re going to take you. You’re going to need a real set of plans for a bank to finance if you’re using financing. It will just help you budget your project, schedule it better and just have a better building experience. So even though people say, “Hey, plans are in. I could buy them for 50 bucks. I can go online and get a copy,” you’re not just looking for a piece of paper. You’re looking for the proper information to build the home properly. It pays off. It’s kind of – you spend a dollar here. You will save a lot more down the road. Interviewer: Yeah, I think that’s interesting you’re talking about these online home designing programs that you can buy and the software. It’s like watching a Major League ball player and they make it look so easy. Oh, I could catch that fly ball to center field, right? Interviewer: Get out there and try it. Steve Landmark: Right. Hey, this guy just walked up with a stick and hit this ball and it went out of a park and the crowd went wild. It took him five seconds. Why can’t I do it in ten? It’s similar. There’s a technique. Interviewer: Yeah, the internet does allow us to deceive ourselves a lot. Steve Landmark: One of my friends came up with a funny word, Steven. He said a lot of people have internet PhDs. You can learn a lot but you got to understand you have to get accurate and valuable information, not just whatever seems to be floating out there for someone else’s priorities. Interviewer: Right. Yeah. One thing I wanted to talk about today, I asked you about, is energy efficiency. I’ve heard you talk about that in the past. Help me and help our listeners understand energy efficiency and just what’s involved there. Steve Landmark: Well, that’s another one of these situations where people don’t understand. They will be like, “Well, my dad built a house 20 years ago and he just stuck R-14 insulation on the wall,” or R-19, whatever it may be, and you do this and you buy a good window and you do that. You got it put together. But if you look at the homes of years past, the materials are different. Windows aren’t as good. You know, on air and filtration, on our ratings, on new ratings and just a whole variety of ratings and then the understanding of knowledge, of heat loss and heat gain. The efficiency of hot water heaters, furnaces, air conditioning systems. It’s all those details that are important. So what a lot of people sometimes do is like I mentioned, they know what they know. So they revert back to what someone told them or what they think they heard or maybe what they saw on a show. But they don’t understand that there’s actually a little bit of a science to determining how to properly insulate a home. People don’t realize that hey, it still either adds heat or depletes your heat. So that’s one of the things that a lot of people say when they will call up. They will say, “Hey, Steve. I will just put R-21. I will do this. I will do that.” I’m like, “Wait a second. Let’s back up.” The proper installation of the insulation but also understanding that insulation, making sure that it’s installed properly, making sure that your energy efficiency of the furnace is right, of the hot water heater. Should you go with an instant hot water heater? Details like that and then just different measures to make sure that it’s installed properly. So there’s a lot more knowledge that is out there. It just doesn’t hit the street and everyday persons out there building. So again, it’s one of these things of the common fallacy compared to the reality of how it’s done. Everyone has got a job. Everyone has got a business. Everyone has got something that they do in life and what they might hear on the street or through their friends is probably a lot different than the reality in their life, when they’re being a professional at their job. So just like the baseball player we’re talking about, you don’t just walk up to a plate, swing a piece of wood, hit this ball and it goes out of the park. There’s a lot of work and technique in doing it right. It’s the exact same thing with the energy efficiency. A lot of people don’t realize just the orientation of the house to the sun can affect the energy efficiency of your home. The color of your roof, the size of your overhangs. Interviewer: Yeah. These are things that people – I mean, you know, the average person isn’t going to – they’re just thinking about here’s the way I want it to look and I want to open the door and walk in tomorrow and there’s so much involved. Your company Landmark Home and Land Company, the processes that you’re able to help customers go through is – it goes above and beyond. I mean like I understand from the website that you guys are able to assist customers, new home builders with – in dealing with building departments and in obtaining building permits and I think that’s pretty intense stuff. Steve Landmark: Well, it’s actually a pretty interesting part because sometimes building departments aren’t the best at communicating nor do they really stick their neck out to help. Some are very good. Some are a little more limited. You know, well, I kind of understand that. So the idea is, is we’re able to talk their language. So when they say something like that, if they don’t have a published list or they don’t – we could talk to them and say, “OK, you need plans. So do you need a foundation design? Do you need elevations? Do you need a roof plan? Do you need structural engineering? Do you need energy calculations? Do you need site plans?” and suddenly it’s interesting of how they open up or they transfer you to the person with the proper knowledge. That’s a key thing to it because again, understanding the process, we’re able to help the customer by asking the right questions, getting things positioned. So that they get the details on the set of plans for a quicker and easier permit application and permit issuance. So a lot of building departments are like that. They’re limited. But then there are others that are extremely sophisticated but even the extremely sophisticated ones sometimes have follow-up questions that are just beyond the typical person’s knowledge base. So it’s not a problem for the customers. We call up. We talk to them. We work it through and then we get the details and get it put together, so it’s easy. What we have is a – like a one-stop shop. So someone call up and say, “Hey, I want to build this 2000-square-foot home outside of Denver in the mountains,” and we can help them through the process. They don’t have to understand energy efficiency. They don’t have to understand rebar. They don’t have to understand the different roof systems. They might say, “Hey, I want a metal roof,” or “Hey, I want a crawl space,” or a basement or whatever it is. But they don’t have to know the technicalities of that. I think that’s how we kind of arm them with the proper information, so they can go get the right bids, working with contractors properly and Steve most importantly is they have a resource to call. Interviewer: Well, I think that’s the best way to describe your website is that it is a one-stop shop. There’s so much information on there and videos and text and articles and it’s just – it’s a good place to start for sure. Speaking of understanding, you had talked about structural design a little earlier. Can you kind of go in into that process as well? Tell us a little bit about understanding basic structural design. Steve Landmark: Yeah. Well, the situation where people get caught up in that is a lot of people think structural design is someone just taking a plan like the plans that you sketched or drew yourself. Then you go to structural engineering and you give them a couple of hundred bucks and he stamps your plans and you go on and get a permit. Well, maybe 10, 20 years ago in certain states they would do that. But now the code is pretty defined as to what needs to be engineered and the calculations and details required. So one of the misconceptions, which is out there, is that you just find one of these engineers. Well, the reality is, is an engineer has a code of ethics as far as what they need to do to properly design it and a certain standard of care, which is typical for the area. So there’s a lot of people that think, “Oh, I will just go down to the coffee shop, meet my local structural engineer, get a set of plans stamped for a couple of hundred bucks and go get a permit.” Well, structural engineering has changed considerably. So in the States, pretty much the whole East Coast now, because of the hurricane situation around the gulf and in Texas, you need hurricane engineering if you’re by the coast. If you’re in a little area it’s not as big of a deal, but there’s a lot of places with expansive soils. That can happen anywhere. But a lot of times, it’s Arizona, New Mexico, California, Texas, Colorado and a lot of other places. There could be some very expansive soils that can heave foundations. So you need proper foundation design. Of course in the mountains, there are snow loads and high winds. People don’t always think of that. They see pictures of a lot of snow in a house. So we’ve got to do the structural engineering so that a house can support a certain weight and this can be anywhere north. This could be in Washington State. This can be in Northern Minnesota, the Rockies, the Sierras, anywhere in the Midwest. There are snow loads. The East Coast, the Northeast. There are snow load situations and then of course there are earthquakes. You know, commonly California of course comes to mind. You got to design your house. So the house doesn’t fall apart when it gets shaken. There are fault lines along the Midwest and the East. They’re just not as active and building departments don’t think of it as much even though it’s part of the code. It should be there in certain places. You should do it. But I think the point that needs to come across is structural engineering is an actual discipline where they go through and determine what needs to be done in your house. So let’s just take a home in Colorado. You got winds around mountains and you’ve got big snow loads and potential expansive soil. You have to make sure that the house will support the snow that falls and stays on it. You have to make sure it will be able to resist the winds that race around the mountains and you also have to make sure that the foundation doesn’t get lifted up in an expansive soil situation. So it’s not just stamping the plan. It’s the actual design of that roof system, the beams and posts and walls that support it and also the cement foundation that supports it as well. There’s a lot of work that goes into the calculations of this, defining the materials and most importantly – actually it’s all important – are the connections. So for example, a board won’t just snap but the connection of two boards can break. So there are these metal connectors that need to be specified. So it’s a lot of work. It’s beyond the idea that oh, I just go get an engineer, have him stamped a piece of paper and I run down and get my permit in five minutes. There’s a lot of work that needs to go into it. Interviewer: I know you guys get a lot of inquiries and questions regarding interesting and unique building sites. You know, like somebody who wants to build on the side of a mountain or they want to build in the sand at the beach or they want to – they’re building on some kind of big slope and what – how helpful are you guys with just looking at an interesting building site and telling the customer the best way to go about building on that properly? Steve Landmark: Oh, we enjoy that process because it’s unique. It’s different and there’s a lot of stuff to look at. Let me jump back to the structural engineering because this cuts into it as well. We’ve all seen the news of what happened in Mexico Beach in Florida. Well, there’s also a storm surge that you can’t see. OK? So when – like in that case, the winds will push the water up and it could raise the water to where the whole area floods. So there are some things for code situations where it just makes sense because you have to raise the house on a stilt to be above that storm surge. Now it goes beyond just the house. You got to have the driveway and then the fire department is going to say, “Hey, we have codes. We got to make sure that our truck can get in there or our guys can get in there in the case of some form of an emergency,” or hey, we don’t want you to block your neighbor’s house, you know, their view of the beautiful vista that you may have. So there’s a lot of different situations that we can help, some which are plainly obvious. Hey, you’re on the side of the hill. We got to build a foundation at the side of the hill. Others that are very obvious but no one thinks about. Like hey, I’m stepping on this soil on my beautiful lot. No one thinks about, “Hey, what’s below the ground that’s going to hold my house up?” So geotechnical reports can be very important and that’s where we can guide people because Steve, there’s a lot of misinformation out there. I think it’s important that people have a base where they can call and say, “Hey, what do I do here? I got this great piece of land. How do I do this? How do I know I could get water here? How do I know my foundational fit? How do I know this is even in my budget? How do I know that this design is right?” You know, are there certain things? Because sometimes people have an idea of a design and they don’t realize that it just doesn’t fit very well on the side. It will do an OK job but certain things can be adjusted to make it fit. So there’s a lot of considerations, some obvious and some not so obvious. I think that that’s a lot of places where people get stuck. They don’t understand that there might be a further little situation to sort out. That’s where we can help them. We’re a phone call, a text or an email away. That’s what we do when we design our panelized homes. You know, and help people through the process of site planning and designing their house, so that they understand it. Obtaining a permit is very important. But knowing what you’re building and understanding it and making sure that it makes sense and fits within your budget is equally or more important. You don’t want to have a permit and find out you can’t afford the house. Interviewer: Exactly. If you’ve got time for another one, I’ve got something I wanted to bring up here and that’s organic design. You know, things like having the sun actually work for you, having the house pointed in the right direction so that you can catch a breeze or you can catch the sun at the times of the day that you want and roof overhangs, the importance of those. Something we talked about on a previous episode, thermal masses. Can you talk to us a little bit about understanding organic design? Steve Landmark: Yeah, organic design is – it’s a very, very interesting concept that was kind of developed and pioneered by Frank Lloyd Wright and the idea being that the answers to your design are in nature. So if you simplify a process so that it’s easy to understand – all of us know that if you stand by a window on a sunny day, that sun is going to come through the glass and it’s going to feel hot in there. In fact it will be hotter on the inside part of the glass than it is outside at times. So the idea being is if you orient the house properly, you could take advantage of the sun in winter and then with the proper overhangs, you can keep the sun out of your house in summer. You can do certain things to take advantage of breezes with the proper use of windows and skylights and the proper positioning of them and the proper size. Thermal masses are kind of a – generally masonry or concrete type of components of the house. Like the cement slab of a house. If you have the sun coming through glass, hitting a cement slab, the heat is intensified. So that the cement will hold the heat that it gathers. So it will gather the heat during the day and then it will release it at night. So there’s a lot of elements there and to the design, the overhangs, looking at prevailing winds, looking at ground conditions to make sure that the design of the home is proper. So some customers choose to get very deep into it. Others just say, “Hey, I like this design.” You know, kind of put a couple of things in there to take advantage of the basics. So basically it’s kind of letting nature take care of your house through the proper design. You can get extremely deep into it and rooms that are just comfortable, different effects at different room sizes and ceiling heights can take and choosing different materials. So it’s blending the house with nature and taking advantage of nature to get the benefits of the breeze and design and a comfortable house. Basically the concept is a properly designed house is going to be more enjoyable and affordable to own over time than one that isn’t designed right. Steve, a lot of people don’t realize it but a 1500-square-foot well-designed home is more livable than a 2000-square-foot design that isn’t as good. In America, people think bigger is better and maybe that’s true in some cases. But in a lot of cases, it’s wasteful. So that’s kind of the brief overview. If someone is interested, they should get in touch with us and we can help them at the beginning stages of the design to really, really work through the features of the home to get something that’s very unique. Interviewer: Well, speaking of that, please run through for us. How does someone get a hold of you at Landmark Home and Land Company? Steve Landmark: Well, we’re always available to talk or email or text, whatever is convenient. The best thing to do would be check our website out. There’s a lot of information as you mentioned. It’s www.LHLC.com. Kind of the initials of Landmark Home Land Company. The website is up all the time. There’s a lot of information, good videos, these podcasts. Just written information and pictures. They can also call us at 800-830-9788 or they can email in. Just email mike@lhlc.com and Mike will be able to help you through. If you want to email me directly, it’s landmark@lhlc.com. We will do whatever it takes to discuss properly the project that’s there. We’re just not in the business of saying, “Hey, here’s the price of a home.” We’re in the business of saying, “Hey, this is how we can help you get the end result that you need.” How to get from A to Z instead of just saying, “Hey, here’s A. You figure the rest out.” We’re here to help you through the process through the – complete home building process. Interviewer: Fantastic. Well everyone, that’s about it for this episode of the Panelized Prefab Kit Home Building Show. Once again, I want to thank the President and Founder of Landmark Home and Land Company, Steve Tuma, for sitting down with us and going over some of these important details. It has been a great show, Steve. Once again, thanks! Steve Landmark: Yeah. Well, thank you. I hope everyone enjoyed it and I hope they contact us. Maybe we can help them out. Interviewer: Awesome. All right everyone. Thanks for joining us and we will see you next time.